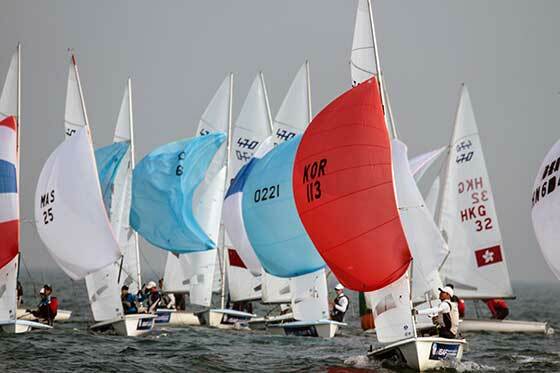 Another day of light breeze and testing current made for minimal separations across the nine fleets competing at ISAF Sailing World Cup Qingdao. 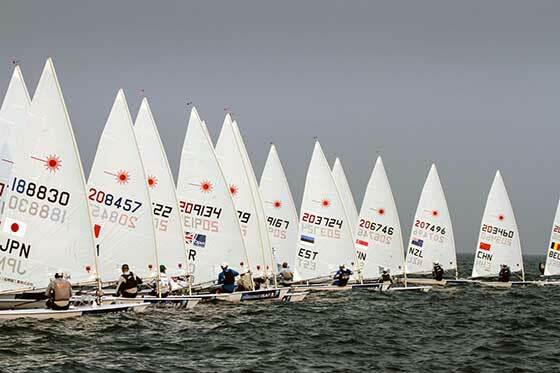 After a short wait for wind the 320 competitors from 32 nations took to the water mid-afternoon for some tight racing where any mistake was duly punished. With the competition reaching the midway point the leader boards are shaping up nicely ahead of Sunday's Medal Races where Abu Dhabi World Cup final spots will be awarded, prize money distributed, world cup medals presented and Rio 2016 Olympic Games spots snapped up. Very little separated the Laser and Laser Radial fleets with packed mark roundings and bunched finishes a common occurrence across the two races in each fleet. Winning races in any sport is a wonderful feeling. Knowing you've controlled a pack of racers behind you generates positivity but in sailing, it's a different game. Across a series of races consistency ultimately pays and France's Jean Baptiste Bernaz has proved this point with a pair of fourths to promote him to second overall, just three points off Lorenzo Chiavarini (GBR). "It was light and shifty, all day," Baptiste Bernaz quickly summarised ashore after racing, "it was just like yesterday more or less. I had a four and four which is a good day, I think." And a good day it was indeed as the Frenchman advanced up the leader board but he knows exactly where he wants to be come Sunday evening, "I came here to win," he exclaimed. "I still have two days to do it in this fleet. It's a good level with sailors from Croatia, Cyprus, Australia, Virgin Islands and Canada. There are many good sailors who know how to play these winds and I'm pretty happy to be second at the moment." Overnight leader Chiavarini was consistent on the day, but not the way he would have wanted it. A pair of 13th place finishes was enough for him to maintain his advantage but only just. Tonci Stipanovic (CRO) was unable to fully start the regatta the way he wanted it with a 27th and a black flag coming from the first three races but things have picked up for the defending champion. He managed to secure an 11th and second to move into third spot. The day's race wins in the Laser went the way of Ryan Palk (AUS), who is 18th overall and the seventh placed Pavlos Kontides (CYP). It's tight at the top in the Laser Radial with two points splitting Manami Doi (JPN), Dongshuang Zhang (CHN) and Isabella Bertold (CAN). Out on the race track both races were exceedingly close. The 28-boat fleet could barely be separated with the competitors looking to gain an edge any which way possible. A matter of metres separated the competitors at the finish which made for some nerves on the race track. However the leading trio sailed well with control. Doi secured a 5-4, Zhang a 6-1 and Bertold a 2-9. If Doi, Zhang and Bertold continue to post strong scores, the chasing pack will struggle to make the gains on the penultimate day ahead of Sunday's Medal Race. Spain's Onan Barreiros and Juan Curbelo Cabrera lead the way in the Men's 470 after a good day on the water, heading back ashore with a bullet and a third to show for their efforts. They are being pushed by China's Hao Lan and Chao Wang who lay in second overall, but it is in the middle of the pack where it starts to get interesting. Fighting for an Olympic qualification place are the Korean and Thailand teams. Currently with their noses in front are Korea's Chang Ju Kim and Ji-Hoon Kim who managed to mark off both ends of the spectrum with a discarded OCS in the first race before coming back to take a bullet in the next. Talking of the first race, crew Ji-Hoon Kim said, "We had some pressure and our minds and we were a little bit nervous. We could not see the line and we just pulled the main sheet and we had an OCS." Kim continued, "Our second race we were fast, and now I think we have a chance for Olympic qualification. We will try hard tomorrow, but it will still be very hard. But I am happy with our sailing." One place behind the two Kim's are Thailand's Navee Thamsoontorn and Nut Butmarasri who ended with a 13th and a discarded 16th. It is still all too play for on the Olympic qualification front with Korea's Daeyoung Kim and Hyun-Ho Yun and Singapore's Darren Choy and Jeremiah Yeo hunting the two teams just ahead of them in the standings. In a three way shootout between Singapore, Malaysia and Hong Kong in the Women's 470 for Olympic qualification, it is Priscilla Low and Shu Xian Lee of Singapore who have the initiative. Low and Lee are ahead of Malaysia's Nuraisyah Jamil and Norashikin Mohd Sayed and Hong Kong's Catherine Carroll and Chi Han Yau. Despite a 15th in the first race of the day, which they discard, the Singaporean pair came back with a sixth in the second race to stay above their Rio qualification rivals. Sitting above them, and all others in the fleet, are Japan's Ai Kondo Yoshida and Miho Yoshioka who finally took the bullet they have been so close to all regatta. They stand top with ten points. Taking the first bullet of the day were the second placed Xiaoli Wang and Lizhu Huang of China. Adding a third to the bullet means they have 15 points, just two ahead of compatriots Sasha Chen and Haiyan Gao. Tied at the top of the Men's RS:X are China's Bing Ye and Tao Li who both sit on 37 points. Ye took a bullet in the second race which was sandwiched between a fifth and eighth which all count on his scorecard. Li however posted a 14th in the second race which he discards. Fortunately for Li he scored two seconds to keep in touch with his compatriot. Overnight leader Mateo Sanz Lanz of Switzerland slips down to fifth on the leader board. China's Jiahui Wu continues to lead the Women's RS:X with a third, fifth and sixth place finish which she discards. Wu tops the leader board with 17 points. Closest rival to Wu is China's Peina Chen on 23 points which was helped by a bullet from the first race, followed by a third and a discarded seventh. Spain's Blanca Manchon is the nearest challenger to the Chinese sailors, lying in fourth overall on 45 points. Lei Gong (CHN) and Luwen Shen (CHN) jockeyed for position in the Finn fleet as they shared the bullets on the third day of competition. Gong holds the advantage at the top of pack on eight points but Shen remains within touching distance on ten points. The third placed He Chen (CHN) has shown he has the beating of the duo after he won the second race of the week but with an OCS his discard, he can't take too many risks if he is to overtake the leading pair. In the 49er, Kim Sungwok and Yang Hoyeob (KOR) are tied on ten points with Bongjim Chae and Kim Dongwook (KOR). The teams have four race victories apiece across the eight races over three days. It's hard to bet against Justin Liu and Denise Lim (SIN) in the Nacra 17 with the pair making it look easy in the light Qingdao air. 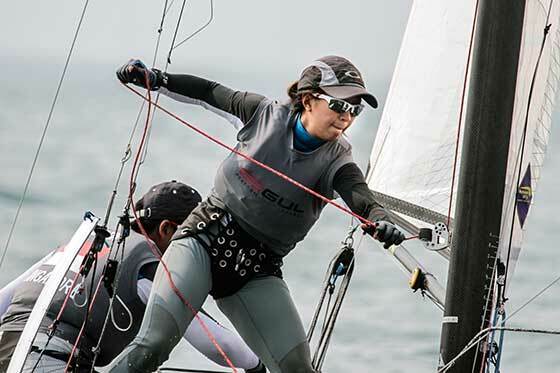 Liu and Lim's lightweight frames have seemingly given them a strong advantage in the Nacra 17 in Qingdao and after a 1-3-1 they have opened up a ten point advantage over Hong Kong's Tat Choi Fung and Yu Ting Chan. Across the week the Singaporean pair have won seven of nine races, dominating the fleet. On the race track itself Liu and Lim have found themselves behind at the first mark on several occasions but continuously push their way up through the bunch for win after win. With the event acting as the Asian Nacra 17 Rio 2016 Olympic qualification regatta, another good day could see them book their spot on the start line and plan their road to Rio. 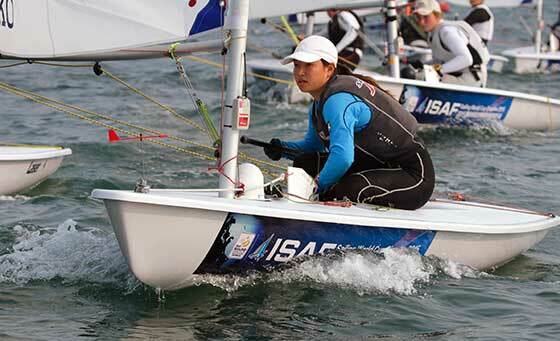 Racing at ISAF Sailing World Cup Qingdao resumes at 12:00 local time on Saturday 19 September.